Cassini’s flagship mission to the ringed planet Saturn ended over a year ago, but data from the craft’s Grand Finale tour of the Saturnian system continues to allow scientists to unlock the mysteries surrounding the sixth planet in our solar system. 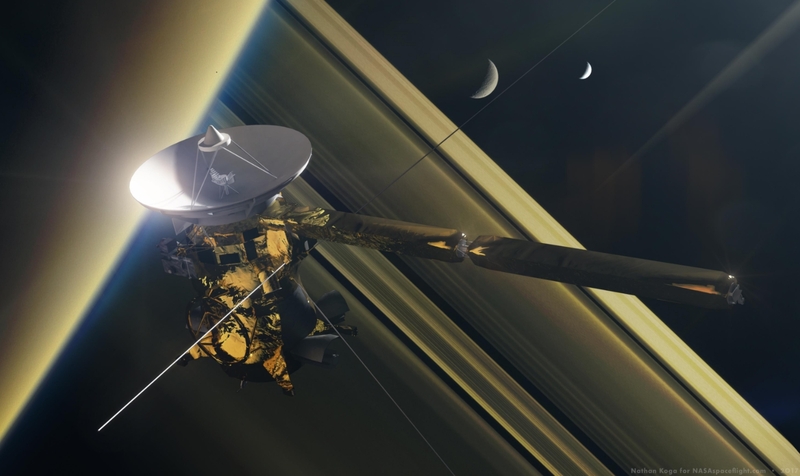 Among the discoveries after the end of Cassini’s mission include a firm understanding of the planet’s rotational period, the the age of the planet’s iconic rings, observations of dust storms on its moon Titan, and numerous other scientific revelations. Cassini’s remarkable tenure at Saturn came to an end on 15 September 2017 after numerous mission extensions and scientific returns that scientists could only have dreamed of before the craft’s launch nearly 20 years prior on 15 October 1997. In an effort to execute planetary protection to ensure Cassini did not accidentally contaminate one of the potentially life harboring moons of Saturn, the craft was plunged into the ringed planet’s atmosphere for a destructive entry after a final set of 22 close orbits of the planet that constituted the mission’s Grand Finale. Knowing this was the end, Cassini scientists did something with their craft that no spacecraft had done before; they flew Cassini through the rings of Saturn and into Saturn’s upper atmosphere multiple times. The daring nature of the Grand Finale paid off handsomely, with a host of returns not possible during the craft’s more stable orbits of the planet in the years prior. In all, the Grand Finale revealed complex organic compounds embedded in water nanograins (very fine, small particles) raining down from Saturn’s rings into the planet’s upper atmosphere, observed how the rings interact with the planet and how inner-ring particles and gases fall directly into Saturn’s atmosphere, and revealed what the material looks like in the gap between the rings and a planet’s atmosphere. In terms of the organic compounds observed in water nanograins, scientists saw methane, ammonia, carbon monoxide, nitrogen, and carbon dioxide – organic compositions far different from the organic compounds found emanating from the icy moon Enceladus and on the methane-rich moon Titan. This result revealed the presence of at least three distinct groupings of organic molecules in the Saturnian system – something not expected. But Grand Finale data revealed that some inner-ring particles fall from the rings and are dragged quickly into Saturn’s atmosphere at its equatorial latitudes at an impressive rate of 22,000 pounds (10,000 kg) of material per second. Moreover, the area between Saturn and its rings revealed even more surprises for scientists when Cassini was finally able sample the material in the ring gap. This sampling showed nanometer size particles, like smoke, residing in the region, suggesting an as-yet-unknown process grinding up ring particles into a smoke-like consistancy. A few of the findings from Cassini’s direct sampling of the rings and atmosphere during the Grand Finale. 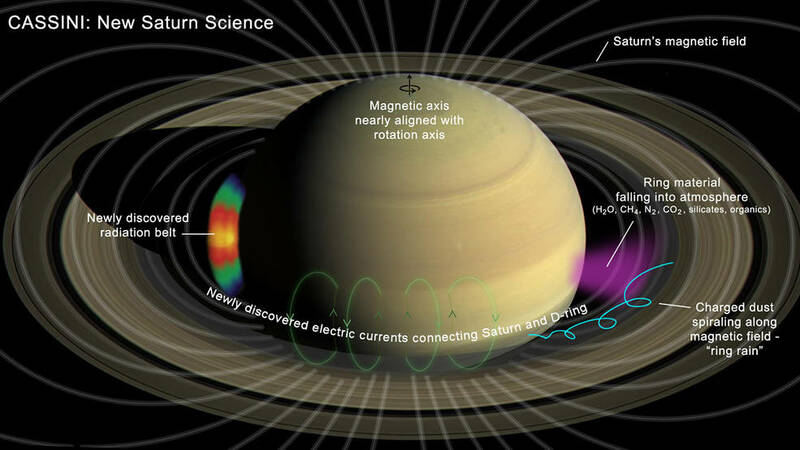 Additional data from the Grand Finale also revealed that Saturn and its rings are more interconnected than scientists thought, with Cassini showing previously unknown electric currents from the rings to the top of Saturn’s atmosphere. For NASA, Cassini’s daring and risky Grand Finale has been more than justified with the host of data returned, with Cassini Project Science Linda Spilker saying, “Almost everything going on in that region turned out to be a surprise. That was the importance of going there, to explore a place we’d never been before. And the expedition really paid off – the data is tremendously exciting. For decades, a persistent mystery has puzzled scientists about Saturn: how long is a day on the ringed planet? It might seem like an easy question to answer, after all, one needs only observe the rotational rate of the planet. But therein lies the problem. Saturn has no solid surface and no defined feature in its gaseous atmosphere to track as the planet rotates. Moreover, the planet’s unusual magnetic field masks the planet’s rotation rate. But as it turned out, the answer to Saturn’s rotation rate, and therefore the length of its day, resided in the planet’s iconic rings. During the Grand Finale, Cassini flew through Saturn’s rings multiple times, observing the icy and rocky components in unprecedented detail – observations that allowed scientists studying wave patterns in the rings to find that the rings respond to vibrations within Saturn’s interior. According to Christopher Mankovich, a graduate student in astronomy and astrophysics at the University of California, Santa Cruz, the vibrations within the rings acted as seismometers measuring vibrations in Saturn’s interior. Tracking these observable waves led Mankovich to develop models of Saturn’s internal structure that’s allowed him to track the movements of the interior and thus calculate Saturn’s rotation rate. Using this data, Mankovich was able to determine that Saturn’s rotation rate is 10 hours 33 minutes 38 seconds. But Saturn’s rings themselves also held a tantalizing surprise for scientists that was not revealed until the Grand Finale dives through this icy and rocky region. Saturn’s rings are its most famous feature and make Saturn the most recognizable and exotic planet in the solar system. But new information from Cassini’s Grand Finale shows that the rings formed just 10 to 100 million years ago, meaning the planet’s most iconic feature is also one of its youngest. 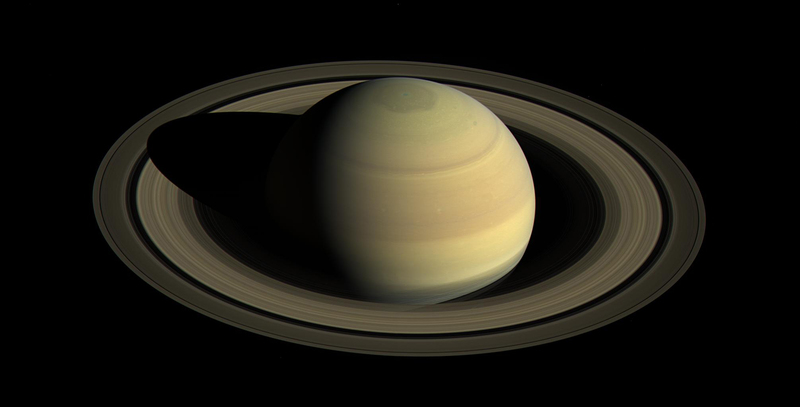 Understanding the age of Saturn’s rings is a matter of determining the mass of the planet, the gravitational pull of Saturn on the rings, and the mass of the rings. In order to directly sample the needed data points, Cassini had to fly between Saturn and the rings, something not permitted during the craft’s primary mission but that became a feature of its Grand Finale. By flying directly between Saturn and its rings, Cassini was able the return data that allowed scientists to calculate how much gravity was pulling on Cassini, causing it to accelerate, down to a fraction of a millimeter per second. With that information, scientists could understand the mass of the planet and the mass of the rings. Cassini data showed the rings have a low mass, corresponding to a younger age of between 10 to 100 million years. Corroborating this is the appearance of the rings, which are bright and clean. An older ring structure would be dark and contaminated by debris. However, it has not just been data gathered during the Grand Finale that has continued to illuminate the Saturnian system; information collected throughout Cassini’s mission continues to be analyzed and continues to reveal new and exciting elements of the system. Titan is a complex world, to say the least, and the only moon in the solar system with a thick and complex atmosphere and with a hydrologic cycle. Now, the impressive moon enters a category previously reserved for only two other bodies in the solar system: the presence of dust storms on its surface. As on Earth and Mars, weather patterns on Titan vary from season to season, and data from Cassini throughout its mission has revealed the changing nature of Titan’s weather, including the emergence of powerful methane storms near the moon’s equator during the northern equinox in 2009. During this period, Sebastien Rodriguez, an astronomer at the Université Paris Diderot, France, and his team noted unusual equatorial bright spots in infrared data returned from Cassini, brightenings they interpreted at the time to be the same kind of methane clouds and storms observed on other areas of the moon during the northern equinox. But subsequent investigations have revealed that these brightenings were in fact something very different. They were not methane storms. They were dust storms. Modeling and investigation revealed the features seen in 2009 where in the atmosphere but close to Titan’s surface and likely formed “a very thin layer of tiny solid organic particles.” The bright spots appearances directly over the dune fields around Titan’s equator left only a single explanation for what they actually were: clouds of dust raised from the dunes. “The near-surface wind speeds required to raise such an amount of dust as we see in these dust storms would have to be very strong – about five times as strong as the average wind speeds estimated by the Huygens measurements near the surface and with climate models,” noted Rodriguez.